Plastic debris on Kamilo Beach, Hawaii. Plastiglomerates – a new type of stone made up of melted plastic and other materials – could be part of the rocky record. The scientists that first described the new stones found them on Kamilo Beach in Hawaii. Their study, “An anthropogenic marker horizon in the future rock record” appears in the June issue of the journal GSA Today. Due to its location within the North Pacific subtropical gyre, Kamilo beach (as well as the Hawaiian Islands in general) acts as a sink for plastic debris: fishing nets, buoys, plastic bottles, and multi-colored plastic fragments called plastic confetti, to name a few, accumulate in large amounts all over the beach. Though we can expect plastic conglomerates to be found all around the world, the remote location of Kamilo Beach favors their formation. The large amount of debris make plastic cleanups difficult to organize, and because the island is remote, campers tend to visit for extended periods of time. By building fires for cooking and warmth, they provide the essential ingredient for the formation of the new stones – melted (or molten) plastic. Patricia Corcoran, one of the scientists involved in the study, told the New York Times that she prefers to call the plastic conglomerates “stones” as compared to “rocks” because rocks are usually defined as things formed by natural processes. Corcoran and the other two scientists that participated in the study (Charles Moore and Kelly Jazvac) found two types of conglomerates, one consisting of melted plastic adhered to rock outcrops (the parts of the rocks that appear above the ground) and the other formed by melted plastic combined with coral, shells, wood debris, and sand. 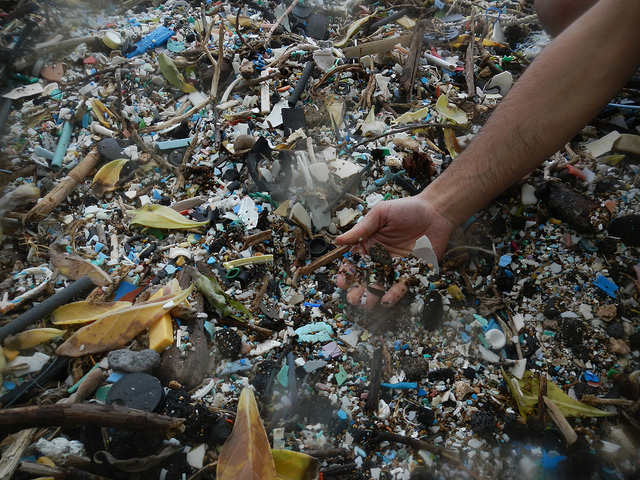 The melted plastic adhered to rock outcrops included fishing nets, piping, bottle caps, and rubber tires covered by beach sand and woody debris, whereas the plastic debris contained in the other type of conglomerate included fishing nets and ropes, pieces of containers and lids, tubes and pipes, as well as plastic confetti. On Kamilo Beach, melted plastic is the result of deliberate bonfires, but scientists believe that similar stones could be formed in other locations through the action of extremely high temperatures, lava flows, and forest fires. Wherever large amounts of plastic are burned, we can expect to find deposits of melted plastic cementing all sorts of debris. These stones may sink to the sea floor, increasing the chances of global preservation. Geophysicist Douglas Jerolmack, who was not involved in the study, told Science “The article is intriguing and fascinating. If these things can be preserved, then they might be a nice marker around the world of when humans came to dominate the globe and leave behind their refuse in mass quantities”. Interesting, and suggests need for better understanding of toxic significance in the environment of plastics. What is the environmental fate through of the various plasticizers in these pollutant plastic accumulations, in saltwater, air, biome, and soon to be in the lithosphere? The question raised here about the fate of plasticizers is very important. My guess is that because the presence of plasticizers is “subtle” and not that obvious as that of macroplastics or even microplastics, it will take awhile before appropriate studies are conducted.